Specialty cake shop located in Bangor Co. Down. 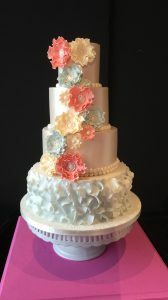 We are here to help you design the cake that complements your wedding theme and as we like to say; it’s your cake, your way. 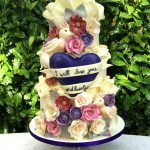 This is why we offer a free consultation when designing your wedding cake. Nowadays the possibilities for the final design are almost endless. 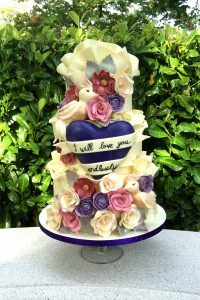 At Jenny’s Cakes we are influenced by many sources, but mainly we take our inspiration from the couple – personalisation is the key! A bespoke theme, for example, a scene from your honeymoon, or an elegant modern classic, all tailored to incorporate your wedding theme. 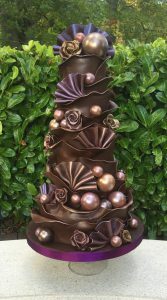 A chocolate extravaganza; anything from a melodramatic Gothic theme to a fun Pastel Candy Explosion. 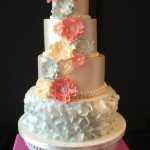 We offer a variety of flavours such as chocolate fudge, zingy fresh lemon, or homely carrot cake and more. We are sure we can give you a combination you will love. 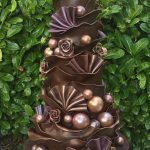 And just to ease the pressure we offer a delivery service to present your special design at your venue, on the day of your wedding. (Dietary needs also catered for).